Tilly just loves this golf ball. She will chase it around the house and then run up stairs and watch it bounce down the stairs. My only concerns is that Wally or Tango could get a hold of it and choke on it (like Oprah’s beautiful golden did when she played with the Cocker spaniel’s small ball). Tilly only gets to play with it when I can supervise everyone. Agreed – Tilly is just gorgeous! I haven’t checked your blog for months now. She’s growing up. How old is she now? 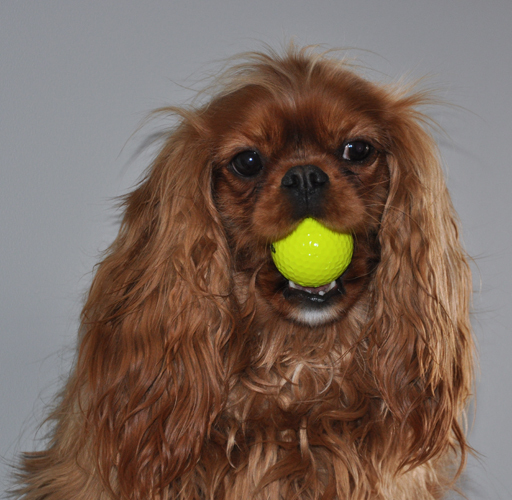 Parker, our Ruby Cavalier, is almost two. She is 18 months old. Regarding the golf balls, Parker loves smaller tennis balls. He even plays fetch, which he doesn’t typically do.